We’re happy to introduce several updates for our Brand Monitoring tool. You’re going to love them – we’re sure! First, now you can receive reports via email anytime you like. Setting up the option is very easy: you can do it in the tool’s Set-up Wizard when you run your first campaign, or in a project's settings. Select your desired mailing frequency (every day or once a week) and the time you would like to receive your reports. You can set an individual report send time for each project. If you select different time settings in three campaigns of the same project, your email will arrive at the time you last selected. 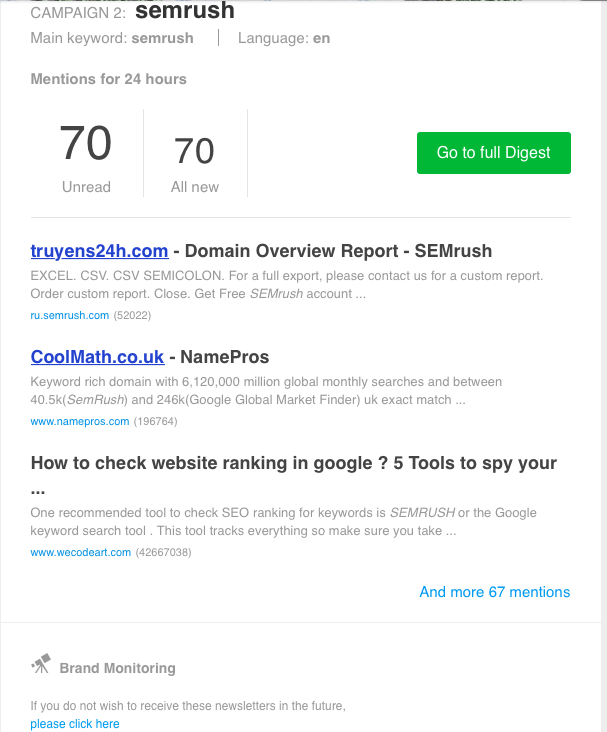 A letter template includes three new mentions within each campaign, unread mentions per day, new mentions per day, and the ‘unsubscribe’ button. The ‘unsubscribe’ button at the bottom of each email leads to the page where you can unsubscribe from any one / several current project’s campaigns, or all newsletters of the Brand Monitoring service. Second, we’ve improved the domain blocking functionality, just like you asked us to. Now this option allows you to lock an entire domain, or one particular subdomain. The third update is likely to please the inhabitants of the Nordic countries: the Brand Monitoring tool knows Swedish now! As always, you can select your language in the Set-up Wizard. Still haven't set up the Brand Monitoring tool? Give it a go right now! And don’t forget to share your ideas, comments and suggestions by emailing us at [email protected].